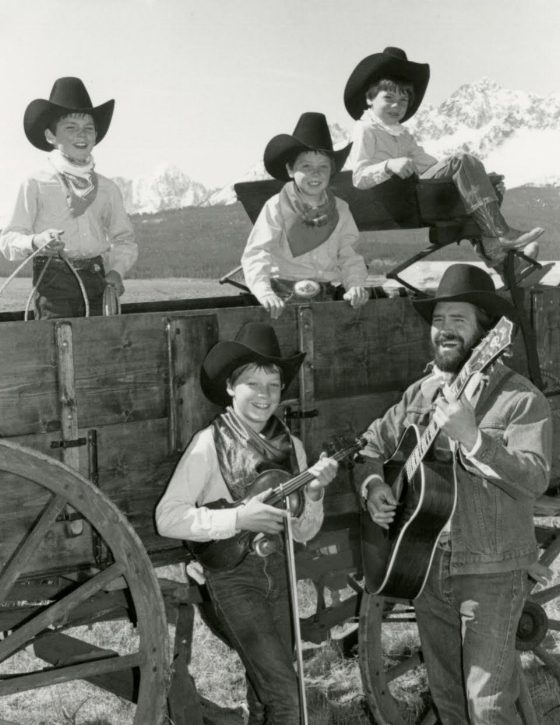 Muzzie Braun and his four boys--Cody, Willy, Micky and Gary--performed at the Elko Cowboy Poetry Gathering six times between 1988 and 1994. Muzzie Braun and the Boys are all grown up now, with successful musical careers of their own. Cody and Willy formed the band Reckless Kelly, and Gary and Micky started Micky and the Motorcars. Both bands have achieved national success with their Western roots music. It’s been 23 years since Muzzie and his boys have performed at the Gathering, and we are super excited to welcome three out of five members of the original band to the 2018 event. Muzzie, Cody and Willy Braun will perform together at the Gathering again. We interviewed Cody Braun about his return to Elko and what his early participation in the event meant to him and his family. The Gathering was one of the larger events that we would do every year. It was the granddaddy of all cowboy poetry events, with all the influential Western musicians. Starting when I was about 10, I got to sit in on jam sessions upstairs at the Stockmen’s Hotel. I got to stay up until the wee hours. I learned a lot about fiddle playing from Woody Paul (Riders In The Sky) and Billy Beeman, who played German fiddle with The Lobo Rangers (with Dave and Patty Bourne). We got to hang out with Ian Tyson, and Ramblin’ Jack Elliott would wake up on our hotel room floor. We met a lot of people who are life-long friends. We are excited to be returning to the Gathering after all these years! Muzzie Braun, Baxter Black and Woody Paul jamming upstairs at the Stockmen's in 1987. Photo by Sue Rosoff. Muzzie Braun, Baxter Black, Ramblin' Jack and Richard Farnsworth jamming upstairs at the Stockmen's in 1987. Photo by Sue Rosoff. Western music was our main influence growing up. I listened to Bob Wills, Gene Autry, Roy Rogers, and honky tonk stuff. We brought the Western country influence to Reckless Kelly which has an authentic country roots sound. Others in the band came from more of a rock background. Willy is the main songwriter. He writes good story-songs. We play about 3-4 times a year with our Dad. When we do, we tend to play a lot of Dad’s tunes, and older Western honky-tonk stuff. We can’t really sing the songs we used to when we were kids because they were written for us as kids. Muzzie, Willy and Cody Braun will perform with Mike Beck on Friday, February 2, in "Who You Callin' Americana?" in the Elko Convention Center Auditorium. The show starts at 8:00 pm and tickets start at $25. Cody and Willy will perform in "Fresh Voices: Cowboy Coffee House" with Wyoming poets Maria Lisa Eastman and Pat Frolander, Canadian cowboy singer Matt Robertson and Utah singer-songwriter Sand Sheff, Thursday, February 1, at 6:00 pm in the Western Folklife Center G Three Bar Theater. Tickets are $35. With the purchase of a 3-Day Deluxe Pass or a Single Day Pass, you can also catch Muzzie and the boys performing Friday morning on the Ruby Mountain Music Stage and Saturday afternoon in the G Three Bar Theater. Tickets and information at www.nationalcowboypoetrygathering.org.